I didn't even need the flexible shaft on the Phillips I thought I would initially as the tabs on the metal piece behind the plastic piece bent easily with a needle nose. Much easier than I thought to remove. You can get a these from bottom. Last edited by SECoda; 10-24-2017 at 01:55 PM. Thanks for the info. Where did you buy the USB plug and did you have to cut any wires to install it? 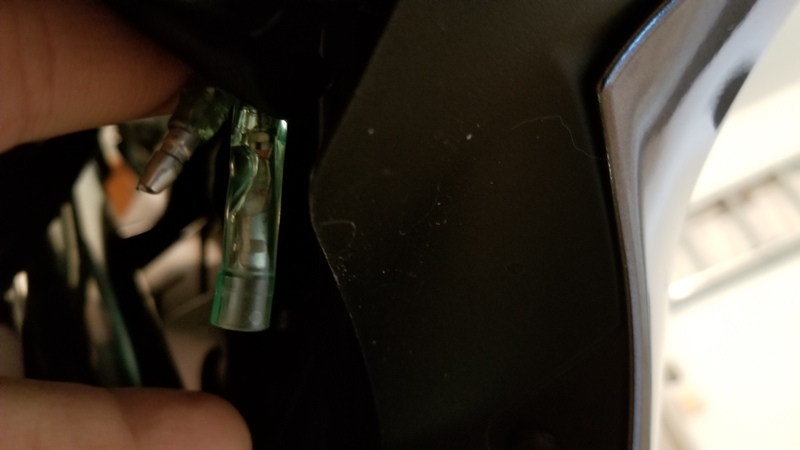 Only wires cut for me were on the Bikemaster 12v outlet if you got the one with the connector like I did. You need to change the plugs to match those on the the bike (std single round Japanese plugs in the picture above). No changes to the bike at all. Those bullet connectors are at O'Reilly - .157". Last edited by SECoda; 10-24-2017 at 03:25 PM. Thanks for the quick response SECoda! is this the dc socket you bought? Looks like the connections are the same just need to lengthen the wires. Yep. 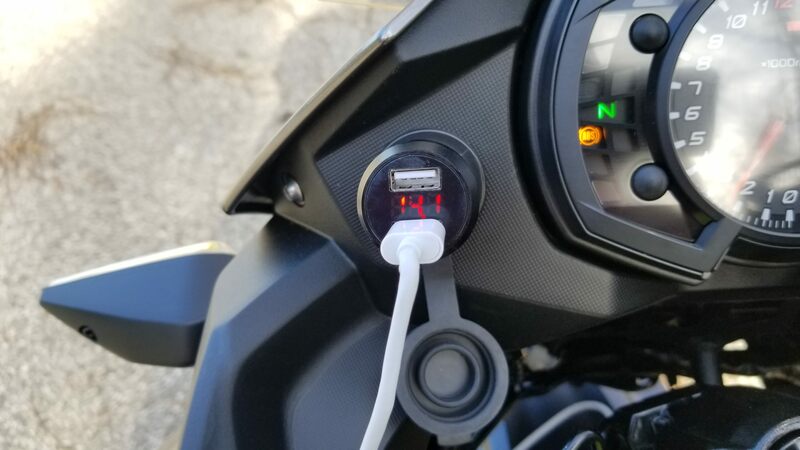 It is a Bikemaster socket with the USB plugged into it. The connectors on the Bikemaster 12v outlet I had are a different size (too big). 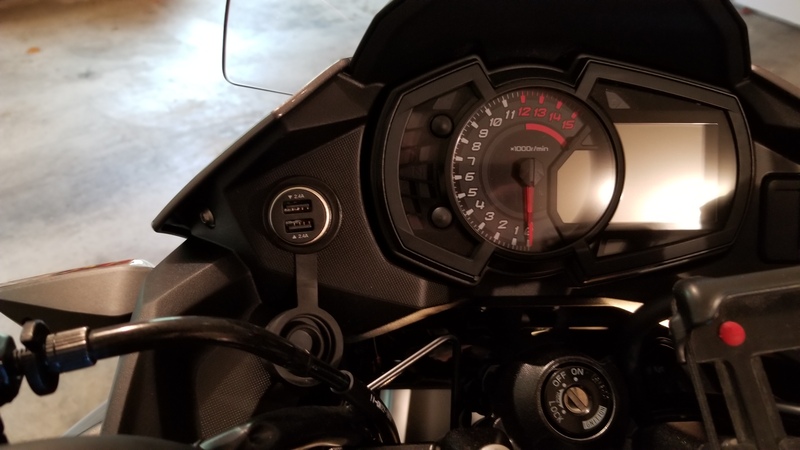 You will need the .157" bullet connectors they have at most auto parts stores to match the connectors on the bike. This has turned into a very informative thread, for now I intend to stick it, eventually I will copy all the informative posts with photos into a pertinent thread in the How To. Thanks to all that have taken the time to post c/w photos, that is what makes this forum special. weljo2001, shifted, SECoda and 1 others like this. SECoda, thanks for letting me bug you and for great info. Really appreciate it! SECoda??? How on earth did you get a shorty phillips head screwdriver behind the plug to loosen it? I've tried every way possible and my hands aren't that big. Did you come in from the top or bottom? I've figured out all the other connections. I just can't seem to get to that phillips screw. I managed to remove the fairing to install the power socket. Let me know if you think I did something incorrectly. I haven't received and installed the relay yet so don't know if it works. Will do another post when I install the relay. Tried to upload a video but wouldn't let me since it was a .mov file. I uploaded to my youtube channel. Sorry - I didn't end up trying that. Once I got a good look at it with a light from the bottom and in a picture online i used some needle nose pliers from the bottom pointed straight up to bend one side of the metal piece ninety degrees. It took me 30 seconds to remove that plug. I didn't disassemble anything to install. You need to cut the nylon tie around the wires that goes to the plug that the relay plugs into. It's pretty easy then to reach down plug it in and then mount the relay on the metal tab they provided. You found the correct connectors to attach the outlet too later on (not the white double plug you first saw). That's it. I had a Bikemaster already at home but with a much longer wire and the wrong connectors. Too long and I cut the wire and put new bullet connectors on. That wire looks maybe too short? Last edited by SECoda; 10-27-2017 at 10:21 PM. I found a aluminum dual USB plug-in on Amazon with a voltmeter in it. I have not found a black 3 ft. C-USB cable yet for connecting to my phone (Samsung Galaxy 8). They are all white. Last edited by SECoda; 10-27-2017 at 10:23 PM. Oh boy! Guess I could have saved myself a lot of hassle. But, it was a good learning experience. The leads were the same length as the factory ones. Just had to loosen up the wire ties and it was just long enough to connect with no modifications. Relay is on order since dealer didn't have it in stock. Hopefully when I fire it up the bike won't catch on fire. I found this. For the next guy/gal. I found a black 3 ft. USB to USB-C cable and they (a pair of them) should come today on Amazon Prime! Last edited by SECoda; 10-29-2017 at 11:15 AM. Extremely helpful thread! Especially for those of us kinda intimidated by electrical stuff. Got the Bikemaster socket and relay on order, should be here midweek and will have a total of about $22 into it. Great pics and vids, thanks all. Btw, this is what I used to get the plug out. Couldn't see anything, just went by feel. Hey Scooter! The one I tried was not as small. Should have looked for one like yours. Would have saved myself some hassles. Thanks for the pic. May need to use something like that on the other side when I install the running lights. I guess I will tap the power in the back as you did for the Knight Riderz light bar in the back. I need the brake wire too. When I enquired at Kawasaki about an OEM power outlet they said $210, I think because you need a power relay as well to light up the 300's accessory wiring. Instead I went to an electronics store downunder called Jaycar (do you still have Tandy's) and bought a marine suitable outlet for $6.95. I then probed with a meter and found switched wiring to the tail light. Australian regulations require hard wired head/tail lights. 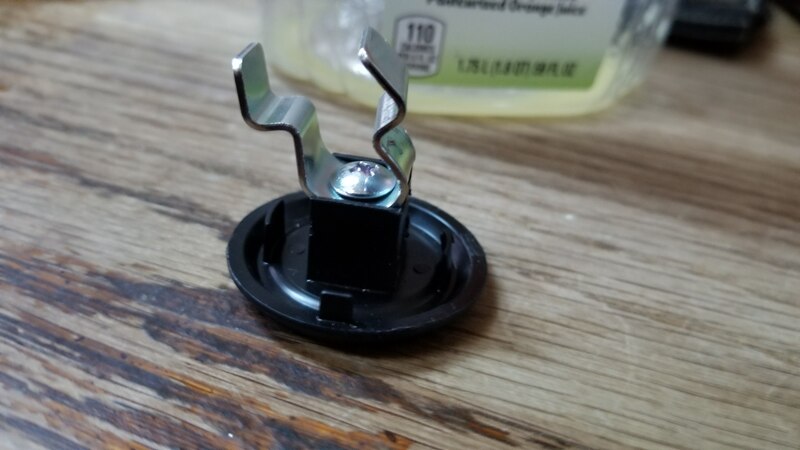 The tail light plug is pictured below below. Red is power, Black/yellow stripe is earth. I used those crimp on splicers to avoid soldering or cutting at circle A. the other half of the plug is B. Here is the finished connection with the blue splicing units tucked out of the way and with the plug reconnected. Here is the plug in place. The hole was just a little tight so I opened it up a tad with a rat tail file. Note the second connection. I twisted the red and white wires from the tail light with the red and black wires from half of a SAE bullet type connector and soldered both pairs into the plugs that connect onto the power outlet. $3.45. I will use the other half of the bullet connector, soldered to a wire-in 12v to 5v adaptor to mini USB ($19.95) which will be permanently wired to my fixed Mobius camera. That is a neat and easy tail/brake light. The Black/Yellow stripe is the earth and the Blue/Red stripe which changes to plain Blue at the connector is the signal power from the brake switch. The colour coding on your accessory light seems perfect. Last edited by Brockie; 11-12-2017 at 08:25 PM. Last edited by onewizard; 11-13-2017 at 09:16 AM. Now - there's something about this power socket thing I don't understand; what does that little thing with only two terminals doo - the one sold as a relay ? To my best knowledge, you need 1 terminal for for control signal (usually a +), 1 for ground, 1 for + in and 1 for + out (to whatever you want it to power). So how do we have a relay with 2 terminals ?!? Google will only find me flasher relays with only two terminals. But: has anybody found a ignition controlled live wire near the front of the bike ?